This week’s Weibo Wednesday will kick off with three couples — can you guess who they are? 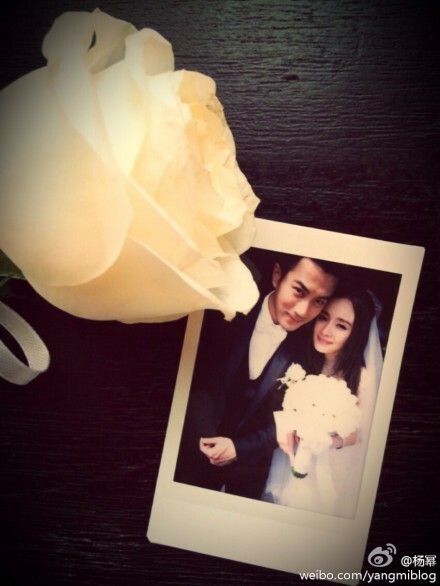 First is none other than Yang Mi and Hawick Lau, who got married in Bali on January 8th. Thank you for everything today, thank you for all of your blessings, thank you all, I am married. Some sharp-eyed netizens noticed an ironic Weibo post from October 2011, shortly after Yang Mi and Hawick filmed the MV for “Thorny Embrace” (刺猬的拥抱) together. In it, Yang Mi denies the relationship rumors with Hawick… only to go public not three months later, on January 8th, 2012. 1000 million yuan Sci-fi movie Kungfu Cyberg finished filming yesterday with director Jeff Lau and leads Hu Jun, Sun Li, Ronald Cheng Wu Jing, Alex Fong, etc. “Kungfu Cyborg” will air in the summer.